Pool Boy® III Automatic Pool Cover Roller. Battery-Powered Reel for Solar Blankets. Fixed Height Stands. Model 8105. Free Shipping! Pool Boy® III Automatic Pool Cover Roller. Battery-Powered Reel for Solar Blankets Model 8105. The Pool Boy® Powered Solar Blanket Reel is a battery powered roller system for your solar pool cover. The Pool Boy® provides a fast and convenient way to cover and uncover your pool. It easily extends and retracts your pool cover with a push of a button. The Pool Boy® design eliminates hand cranking and tugging on solar blankets providing effortless operation by one person. Features adjustable height and remote control. Product Application: For pools up to 20 wide x 40 feet long. Recommended for use on rectangular shaped pools with or without diving boards. At the heart of the Pool Boy® design is the remote operating system. 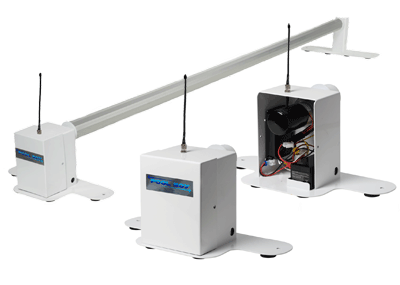 The system features a low voltage transformer that is designed to meet NEC article 680. The remote control is completely waterproof and floats. Pool Boy III is a battery-powered version in the Pool Boy series. Comes with a 12 volt re-chargeable battery and charger. The Pool Boy® III comes with fixed height stands. Each upright is fabricated from steel and is e-coated and powder coated to protect against corrosion. The height from the deck to the center of the hub is 7 1/2"
In many parts of the country where the average pool season lasts 4-5 months, the pool owner may see an energy cost decrease of up to 75%. This benefit alone makes Pool Boy® a great investment for any pool owner. In most cases, the first year energy cost savings that Pool Boy® provides is greater than the original purchase price of the Pool Boy® system.